This buzzing, hard-working bee is shown collecting nectar from a flower. 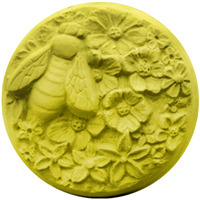 Featuring some lovely detail, the Bee & Flower Soap Mold is perfect for a spring or summer garden basket. 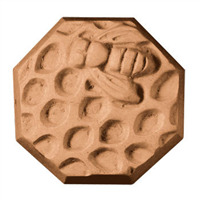 "Bee & Flower Mold 59"
COMMENTS: This is really adorable. 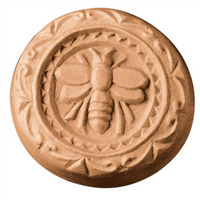 We color the flower and leaves and the bee different colors and use honey scent for our bars. Everyone really loves them. It makes 4- 4 oz. bars. So pretty. WSP sells another mold like this with hummingbird and flower, just as cute. The mold washes easily, warm water. It unmolds very easily, just freeze for a couple of minutes after setting and gently push out your bars. It will last for years. "What are the dimensions of the finished product? Diameter? Depth/height?" Staff Answer Each bar measures 3" across the widest part, 2.5" across the shorter part and 1.25" deep at the deepest point.